Opportunities to celebrate faculty accomplishments, learn how to partner with foundations and industry, and explore research interests are available at the fall Research Fair, Nov. 6-8. Faculty, staff and students should mark their calendars for this biannual celebration of research, creativity and scholarly activity. The Office of Research and Economic Development hosts the Research Fair in cooperation with campus partners. Check the Research Fair website for the latest schedule and to register for events. Registration links also are provided in the agenda below. Events are held in the Nebraska Union unless otherwise noted. 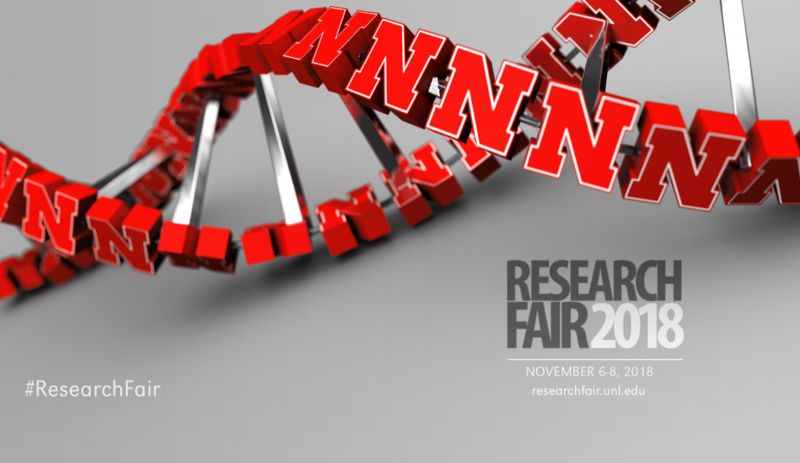 Participants are encouraged to use the #ResearchFair hashtag on their social media photos or tag @UNLresearch on Twitter, Facebook or Instagram. Faculty Recognition Breakfast, 8-9:30 a.m., Centennial Room. The annual celebration of faculty achievements features keynote speaker Susan Fitzpatrick, president of the James S. McDonnell Foundation. Identify Your Unique Professional Value, 10 a.m.-noon, Colonial Rooms A and B. This workshop is geared toward graduate students, postdocs and faculty. The guest speaker is Diane Klotz, Sanford Burnham Prebys Medical Discovery Institute. Foundations 101, 10-11 a.m., Regency Suite. Facilitators are Tamela Spicer and Teri Behrens from the Institute for Foundation and Donor Learning at the Dorothy A. Johnson Center for Philanthropy, Grand Valley State University. UNL Faculty Panel: Collaborating with Private Foundations, 11:30 a.m.-1 p.m., Regency Suite. Gary Kebbel, professor of journalism and former journalism program director for the John S. and James L. Knight Foundation, is the moderator. Grant Writing for Private Foundations Workshop, 1:30-4:30 p.m., Regency Suite. Spicer and Behrens will guide this session. Science Slam: Postdoc Edition, 2:30-4 p.m., auditorium. Eight postdocs will give informal, five-minute talks about their research, with the goal of clearly communicating the impact of their work. The event is open to the public, and registration is not required. Nebraska Summer Research Program Faculty Information Session, 4-5 p.m., Heritage Room. Learn how Nebraska faculty secured funding for Research Experiences for Undergraduates sites, supported by the National Science Foundation, and other summer research programs. Panelists are Donald Becker, biochemistry, Redox Biology REU; Martha Mamo, agronomy and horticulture, Applied Plant Systems Summer Research Opportunity Program; and Mark Griep, chemistry, Chemical Assembly REU. NUtech Ventures Innovator Celebration, 4:30-6:30 p.m., Nebraska Innovation Campus Conference Center, banquet hall. Contact Joy Eakin, NUtech operations manager, for more information. Team Science: The Toolbox Project Workshop, morning session, 9-11 a.m.; afternoon session, 1:30-3:30 p.m., Regency Suite. Please register for only one session. Researchers seeking to improve communication and build high-performing teams for large, interdisciplinary research projects are urged to attend. The facilitator is Michael O’Rourke, the environmental philosophy and communications expert who developed The Toolbox Project. Fall Nebraska Lecture with Eileen Hebets, professor of biological sciences: “Using Arachnids to Inspire D.R.E.A.M.S.,” 3:30-4:30 p.m., auditorium. The lecture is free and open to the public, with a reception following. A live webstream is available here and will be broadcast via Facebook Live. One-on-one consultations, 9 a.m.-4 p.m., Nebraska Innovation Campus. Faculty interested in pursuing National Institutes of Health Small Business Innovation Research and Small Business Technology Transfer funding, known as SBIR/STTR, can consult with federal program officers and representatives from the Nebraska Department of Economic Development and the Nebraska Business Development Center. To schedule an appointment, contact Ryan Anderson, director of industry relations, or Suzanne Spiehs, administrative coordinator. SBIR/STTR Panel: U.S. Department of Agriculture Program Officer Perspectives and Resources for Nebraska Applicants and Awardees, 10-11:15 a.m., NIC Conference Center, banquet hall. Panelists are Jodi Williams, USDA; Nisha Avey, Nebraska Department of Economic Development; Wei Jing, Nebraska Business Development Center; and Ryan Anderson, UNL Industry Relations. SBIR/STTR Success Stories: Nebraska Company Awardees and their UNL Faculty Partners, 11:30 a.m.-1 p.m., NIC Conference Center, banquet hall. Faculty Connector and Science Slam: Research and Creative Activity, 4-6 p.m., Wick Alumni Center. For more information about the Research Fair, contact Lisa Maupin, events and outreach manager, 402-472-0030.